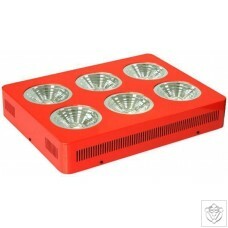 Introducing QUANTUM'S next generation of LED grow lights. The name behind our latest generation of LED lighting derives from the Greek god of the sun and the sun itself. Helios. According to mythology, Helios was known for driving a chariot led by four fire-breathing horses across the sky each day. Protects the LED's from receiving too much electrical current to power them making them more efficient and longer lasting. Has a system called 'Staged, delayed power up' This reduces start up load of electricity surging your light, it feeds the light electricity in stages from lower voltage to optimal performing voltage. This vastly improves reliability and lifetime of the light. All this happens in a blink of an eye. Sends the correct amount of power to every each single LED diode in each cluster at the correct Voltage, or the 'sweet spot'. Not too much Power to 'burn out the lifespan of the LED' or not too little Power 'so maximum output is achieved without risking the life and efficiency of the LED itself'. These High performance Integrated LED's are the centrepiece of our latest high power LED Grow Light, a next generation set-up providing high power and efficiency whilst greatly improving reliability. Integrated LED's are functionally the same as their traditional counterparts, but rather than individually cased LED's they are miniaturized and combined into single, multiple-spectrum arrays. This brings considerable advantages in thermal dissipation, creating a positive effect on lifetime; reliability and allowing us produce lamps that enter the next power-factor. The High Powered 3 Watt LED's are carefully selected from LED Manufacturers such as Bridgelux, Cree and Epistar and thoroughly quality checked before leaving the factory. Each Module has the Mixed Array LED hand soldered onto a Metal Core Printed Circuit Board, these are the best component boards you can get for LED's, again, specifically designed and produced by my own team of engineers. Mounted On top of these are Dual Core, Double Plated Heat Sinks for superior cooling. The heat transfer paste is also carefully selected and tested thoroughly for its best heat dissipation from the LED diode to Heatsink. The whole internal components & Heat sinks are kept cool by High Speed Quiet Ball Bearing Fans. The only slightly warm air that comes from this unit is generated from exhaust from inside the unit from the heat sinks which are designed to transfer heat away from the rear of the LED diodes themselves. The fronts of the lights are slightly warm to the touch. So heat generation is almost Zero. This also helps the Residual Humidity inside the area. The Spectrum we use at the moment is 440nm, 460nm, 610nm, 630nm and 660nm & IR. Even though this spectrum is the currently the best we are always looking for new discoveries in fine tuning wavelengths and spectrums which could mean more newer spectrums may be available in the future. These units are fully upgradeable as well.